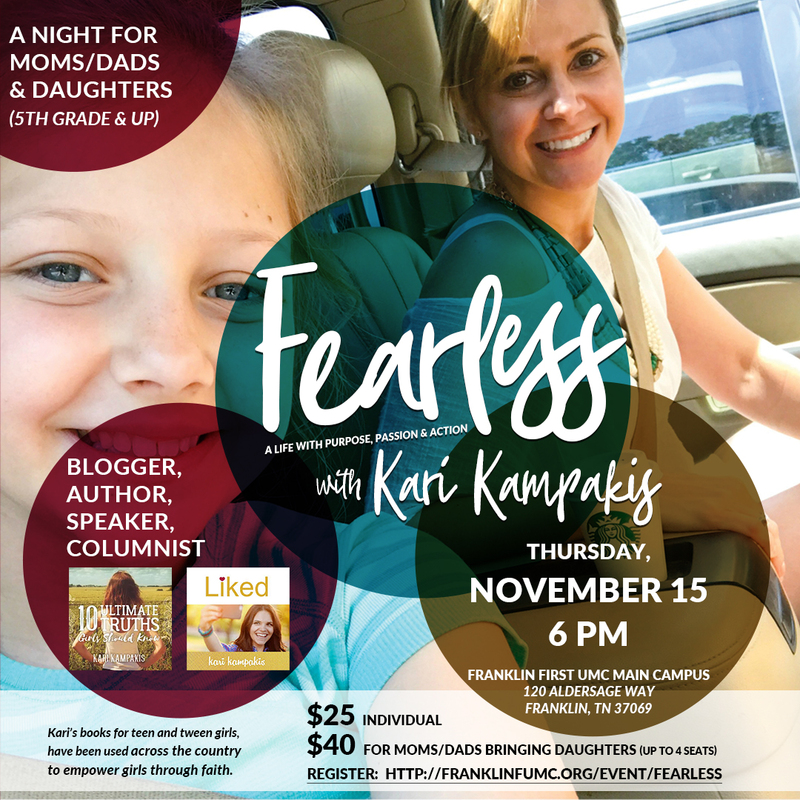 Moms and daughters, join us for a night with Kari Kanpakis on Thursday, November 15 at 6:00 p.m. In a world where social media offers instant feedback on every move you make, living fearlessly for God can seem impossibly hard. But with the right relationships – a relationship with God and loving friends and family – you can become the girl God designed you to be. Join us for a special night with author/blogger Kari Kampakis as she talks about cultivating a meaningful life inspired by faith, friendship, and courage. Kari Kampakis is a blogger, author, speaker, and newspaper columnist from Birmingham, Alabama. Her two books for teen and tween girls, 10 Ultimate Truths Girls Should Know and Liked: Whose Approval Are You Living For, have been used widely across the country by teen youth groups and small groups to empower girls through faith. Kari’s work has been featured on The Huffington Post, The TODAY Show, EWTN, Proverbs 31, Yahoo! News, The Eric Metaxas Show, Ann Voskamp’s blog, and other national outlets. She and her husband, Harry, have four daughters and a dog named Lola.